As the energy needs of modern society evolve and the focus shifts from access to sustainability, security and affordability, electricity is ready to reveal its true potential. Firmly moving toward carbon neutrality and sustainability, electricity is set to be the energy carrier of the future. Achieving the deep decarbonisation of the European economy through electrification provides a powerful pathway. But getting there will require recognition and leadership from European policy makers, investment and innovation from industry, as well as buy-in from its citizens. 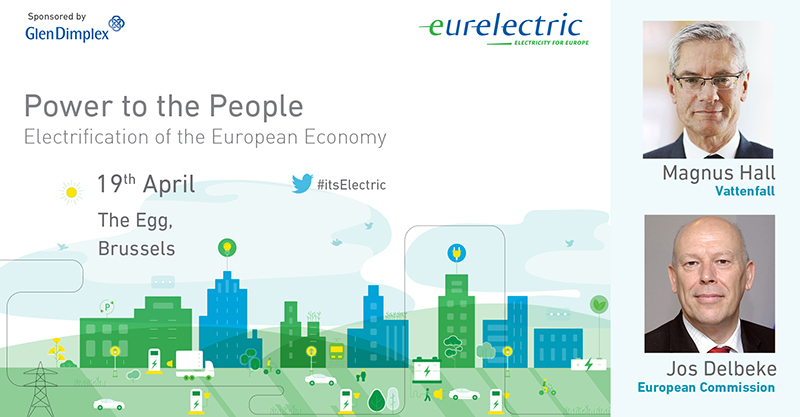 EURELECTRIC organised a high-level event ‘Power to the People – Electrification of the European Economy’. The Conference kick-started the debate on the policy framework needed to drive electrification. In light of the Commission’s Clean Energy Package, specific discussions concerning the transport, heating and cooling sectors are foreseen, along with the key issue of getting customers involved through energy retail pricing. During the Conference, EURELECTRIC launched a report which highlights the value of electricity in a decarbonised European Union. Based on the value which electricity provides today and it will provide in the future, the report advocates the benefits of electrification for key sectors of the economy on the road towards decarbonisation. High level speakers from the European Commission, national representations and industry stakeholders provided their views on the benefits, challenges and prospects of the role of electricity in Europe’s strategy towards sustainability.